Glial cells are support cells for the nervous system. In Greek, Glia means "glue". Glia are said to be the glue of the nervous system. 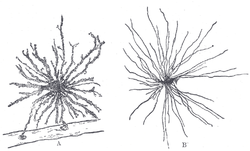 Glia occur in both grey matter and white matter. To destroy pathogens and remove dead neurons. Glia may have more functions than just these four. A type of glial cell are thought to play a role in amyotrophic lateral sclerosis (ALS or motor neurone disease), Alzheimer's disease (a type of dementia) and Parkinson's disease. The microglia are the macrophages of the nervous system. In these neurodegenerative disorders, it is thought that the microglia digest healthy brain cells, causing the degeneration of brain function. This is especially true for Parkinson's disease, where the Glia break down dopaminergic cells, causing the symptoms associated with Parkinson's. ↑ 'Glue' is what the word glia means in Greek. This page was last changed on 28 October 2018, at 07:12.